If you heard that cry a couple of hundred years ago, you would do well to run for cover, because a few seconds later a torrent of foulness would descend from above as someone emptied the contents of their chamber pot. From the seventeenth century onwards, Edinburgh’s population soared and the topography of the area meant that there was only so far the city could extend outwards. It is, after all, built on a high granite rock. Left with no alternative, the people built upwards and made the streets as narrow as they could. Reaching out of your bedroom window, it would be possible to shake hands with your neighbour across the thoroughfare. The Closes could be locked at night to keep out the undesirables – an early form of gated community, perhaps. The streets ran with sewage, rotting vegetation, mud, sludge, butchers’ waste… You name it, it flowed down there, eventually pouring into the reeking Nor’ Loch at the bottom of the hill. A hierarchy developed as the city filled to bursting point. Those living closest to street level, with the ever-present ripe stench of sewage directly under their noses, were the poorest. The higher up your apartment, the more important and well off you were, and Edinburgh can lay claim to being the first city to embrace the skyscraper. Many of the buildings soared up to eight storeys high. Then the Georgian New Town was built, at which point most of the wealthier inhabitants relocated to its wide, elegant streets. The Closes’ names often reflected the industry that went on there – such as Distillery Close, Fishmarket Close – or were named in honour of someone connected with it, as in the case of Mary King’s Close. Mary King herself was a successful merchant in the seventeenth century who had a shop on the High Street, selling fabrics. So successful was she that the Close – which had been Alexander King’s (no relation) Close – was renamed after her following her death in 1644. At the time, naming a Close after a woman was highly unusual. As time went on, most of the Closes were demolished or redeveloped, although a number still remain. Mary King’s Close suffered a different fate. It was partially demolished when the Royal Exchange was built in the 18th century, leaving only the lower storeys underground. It remained open at one end and some intrepid traders continued to ply their businesses – selling tobacco, making wigs and supplying a variety of goods and services, but at the turn of the twentieth century, it was finally closed to the public after the last inhabitant left. Mr. Chesney was a sawmaker and he didn’t want to go. He hung grimly on until 1902, by which time the Royal Exchange was to be extended, resulting in the remains of Mary King’s Close being sealed off permanently from the outside world. Mary King’s Close today is like a time capsule. As you wander its cobbled streets, accompanied by a knowledgeable tour guide in period costume portraying a typical character from a period in the Close’s history, it is not hard to imagine how life must have been. Edinburgh saw a number of severe outbreaks of plague and Mary King’s Close was quarantined, its residents locked in while food and water was left for them by the gates every day. The plague doctor, Dr. George Rae, would visit, wearing his hideous crow-like mask with its enormous beak stuffed full of sweet-smelling herbs. 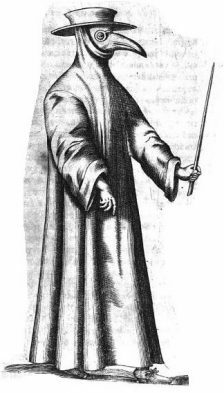 At that time it was believed that plague was associated with noxious fumes – and there were plenty of those wafting up from the street and worse from the Nor’ Loch. The council had agreed to pay Dr. Rae a vast sum of money, never expecting him to survive the outbreak. After all, his predecessor had succumbed. But Dr. Rae did survive and claimed his money. For ten years, until his death, he fought to get what was due to him. He never succeeded. Small wonder that with all the misery of overcrowding, poverty and disease, stories of hauntings would begin to circulate. Mysterious lights, apparitions. The legends grew over the years. A few years ago, a Japanese psychic visiting Mary King’s Close said she had seen a young girl called Annie. Allegedly she was a plague victim, abandoned by her parents. She wanted a doll to keep her company. 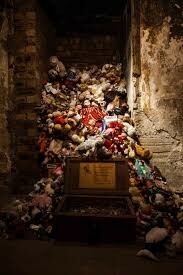 In Mary King’s Close now is ‘Annie’s Room,’ stuffed full of dolls, teddies and other toys. The on-site infra-red camera picked up a translucent figure one night after the building was closed. Its identity has not yet been established. 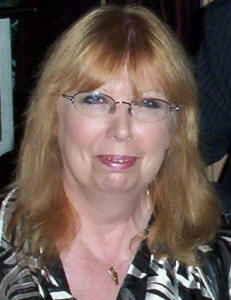 Following a varied career in sales, advertising and career guidance, Catherine Cavendish is now the full-time author of a number of paranormal, ghostly and Gothic horror novels, novellas and short stories. 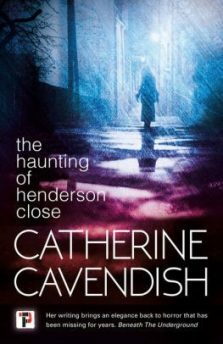 In addition to The Haunting of Henderson Close, Cat’s novels include the Nemesis of the Gods trilogy – Wrath of the Ancients, Waking the Ancients and Damned by the Ancients, plus The Devil’s Serenade,The Pendle Curse and Saving Grace Devine. She lives with her long-suffering husband and a black cat who has never forgotten that her species used to be worshipped in ancient Egypt. She sees no reason why that practice should not continue. Cat and her family divide their time between Liverpool and a 260-year-old haunted apartment in North Wales. (Henderson Close is loosely inspired by the Real Mary King’s Close but is nonetheless a work of fiction. You can visit the real thing if you click on their website: The Real Mary King’s Close). I’ve taken the tour in Edinburgh and yes, it does feel haunted. They also say a lot of skeletons have been pulled from the loch over the years. Oh, I would love to go. Lucky Alex! Gardyloo! Those streets sounded like they were pretty ripe. I feel for the Dr. who never got paid…freelance gig gone terribly bad. What an interesting subject to focus on. Great post and congrats on the book, Catherine! Your book sounds spooky and fascinating, like the description of old Edinburgh and its haunted inhabitants. Just due to being in Edinburgh while waiting to get to Canada, my grandfather was born there in 1874. I now wonder if they lived near there since they were poor. This is a very interesting history and , I think, many cities had similar issues which is why the plague took hold. In some ways the smell was indicative of disease but a shame they never figured it out. I bet there would be haunting sand I would love to visit there. Scotland has been at the top of my bucket list for far too long too. Sadly, that sounds all-too familiar. That sounds like a creepy place. Glad we have better systems for a more hygienic living environment now! In some areas of the world, yes. In others, no. 🙁 When you see people bathing in the same river they also use as a bathroom, it’s a huge eye-opener. Edinburgh also has a huge underground system of tunnels and streets apparently! 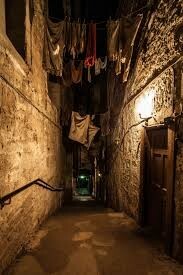 Mary King’s Close was on the itinerary of my Haunted Scotland tour last October. We didn’t have any supernatural experience that night, but the history is fascinating, as is all of Edinburgh. My mostly Scottish traveling companion opined all of Scotland is haunted and sooner or later you are bound to encounter a spirit or two. I still haven’t gotten the full details of that trip! Hoping for a tell-all book or at least a blog post or four. This was a really interesting post although I feel for the poor doctor. Now I need to visit Edinburgh and buy that book! Hope you love it, Debbie. It’s a great choice for February–Women in Horror Month. Edinburgh sounds like such a fascinating city. With all those haunted Closes and such an intriguing history, I can see why Cat’s most recent novel takes place here. Inspiration galore! And, writing talent galore as well, based on this blog post which reads like a charm. That is cool. I’ve been plotting a trip there and I might have to go check that out. Lucky you! If you do, please report back. I was in Edinburgh in 2017. Want to visit again, but might as well take the journey via this book first! Great choice. Cat rocks! You will love it. I went to Edinburgh but didn’t see this part. I’d love to return, especially for the book festival. I love spooky (not terror-inducing) stories! Scotland is very high on my bucket list as well. I’d love to go!